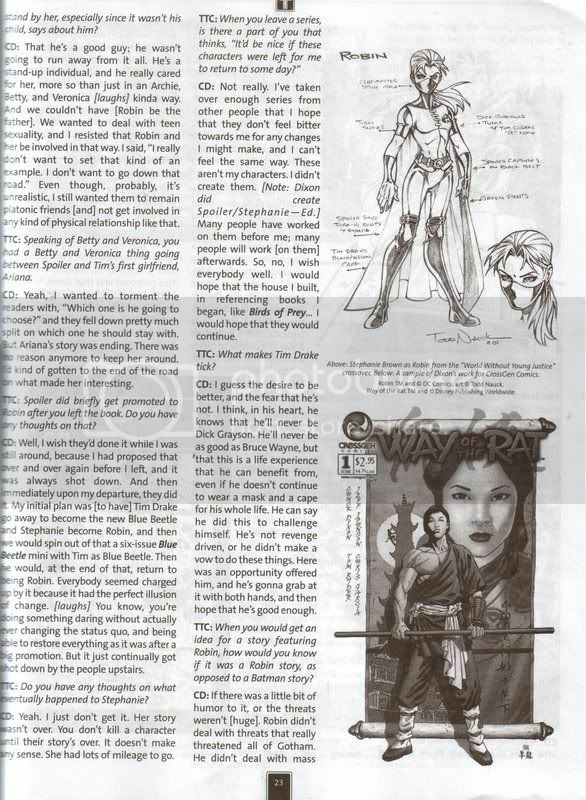 TBU: There were a number of female characters that were introduced as foils and some lasted longer than others. Lynx, Ariana Dzerchenko, Dava, Bridget Clancy, Echo and Query, with the most popular being Stephanie Brown a.k.a. the Spoiler. Which of these did you enjoy writing the most, and did their stories reach the intended end point you had in mind? Chuck Dixon: Stephanie Brown is the one I have the most affection for. She seems most alive in my mind, wholly formed. I know what she’ll do or say in any given situation. And it’s funny, because she was created as a one-time plot device. But readers wrote letters asking when they’d see her again. I’m not happy with anything that was done with her after I left. Dava, Bridget and Ariana are characters that did reach the end of the arcs as useful characters in continuity. I never had plans for them after their final appearances. But I did have ideas for Stephanie I never got to write. TBU: When you created Stephanie Brown, was her character meant to last for that one story? She was illustrated somewhat older in her first appearance and her later flirtation with Robin wasn’t there. Was she originally meant to be an older character? Chuck Dixon: I wrote her as a sixteen-year-old which would make her a little older than Robin but still keeping them minors. Some artists have trouble with drawing various ages. Even the best artists can draw a character either too mature or not mature enough. But, to me, she was still in high school. TBU: You’ve spoken before about proposals you had for Stephanie to become Robin and for Tim Drake to become Blue Beetle for a six-part miniseries. What were some of the ideas that went into that story? How would you have portrayed Steph’s relationship as Robin with Batman? Chuck Dixon: Batman would have been impressed by Steph’s work ethic and dogged determination. Both of these were at the core of her character. She would have worked harder at being Robin than anyone else had. Even Tim. In the end though, Batman would find himself hampered by the responsibility of having a female sidekick. His natural, “preux chevalier” instincts to protect her would have made their working relationship impossible. Over with Ted Kord, Tim would have been kicking it as Blue Beetle; a role far more suited to him than being Robin. Naturally, some catastrophe would have drawn him back into the role of the Boy Wonder. TBU: What led to your return to the Robin title? Tim Drake’s life was drastically different by that time, with the death of his father and the seeming death of Stephanie Brown. What was it like returning to his world? Chuck Dixon: A total whim on management’s part. I was in Manhattan visiting other publishers and stopped by DC to see a few people. As in Caesar’s court, I caught the momentary attention of the emperor who, in a display of his power, gave me a book on the spot. Like when Caligula appointed a chariot horse to the senate.And, on another whim, I was shut out again. TBU: During your second run on Robin, Tim seemed like he was angry with Stephanie for faking her death. That thread went in another direction when you were replaced. What were your original plans? Chuck Dixon: I’d eventually reconcile them. It’s how you write fictional romances. There’s always something pulling them apart with force equal to what draws them together. But their relationship would be edgier after everything Stephanie went through. 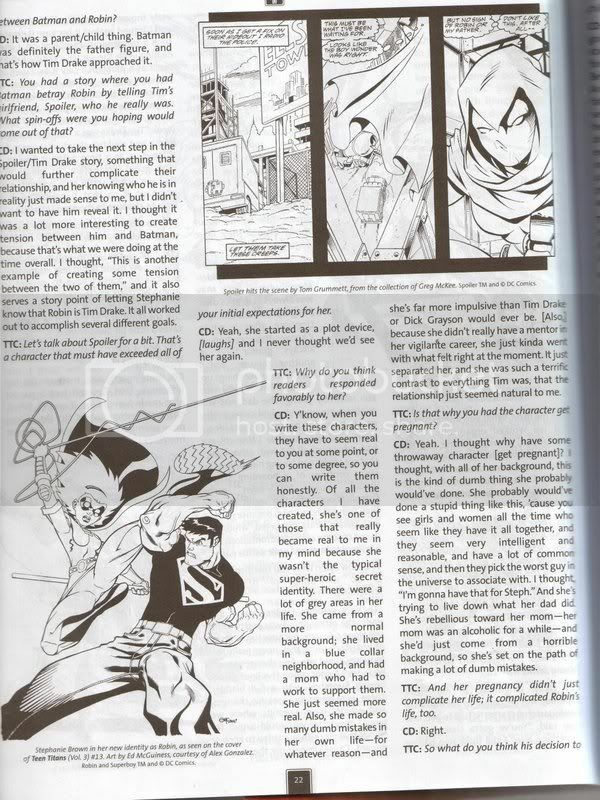 TBU: When you were reviving Stephanie over in the pages of Robin, there was a book called “Gotham Underground” dealing with what seemed like (at the time) a different Spoiler who was working for the Penguin with the power to turn invisible. While later writers reconciled it, what was the plan at the time? Chuck Dixon: I’m not sure there was a plan. Editorial had flipped the continuity table over and everyone lost track of where everything was. Even before the current regime, there was growing resistance among editors to play nice with each other. TBU: In your essay to the Wall Street Journal, yourself and Paul Rivoche opined that comic books have descended into left-leaning politics and moral relativism. Specifically, an issue of an AIDS storyline that you objected to was brought up, where you were given less work after expressing your objection to the story being done. How would you compare that to the storyline of Stephanie Brown’s pregnancy or Karl Rank’s death from teen gun violence? In the way you wrote them, would you say they were less innately political than the AIDS story? Chuck Dixon: My editor on both of those stories was Denny, perhaps comicdom’s most famous bleeding heart liberal. That said, we never got along anything but famously. I am staunchly opposed to presenting political opinions in mainstream comics. No manifestos from Spider-Man. The reader should be able to project themselves on these characters. That’s necessary when writing heroic escapist fiction. Superheroes are wish fulfillment characters. We want to be Superman. We hope we’re as principled as Captain America. It’s important that these characters portray only the most universal values. Now, I wanted Robin to maintain some level of relevancy to his readers and, at the time, guns in school was a huge issue and teen pregnancies were at their highest numbers. To ignore these issues was to make Tim Drake as out of touch as Archie Andrews was at the time. I approached Denny about these ideas and he was fine with it as long as the issue served the story. That was all I wanted, for these real-life troubles to provide dramatic grist for a solid story. I believe we succeeded. Steph weighed every option she had and came down on adoption (which she at first rejected when she was offended by the mercenary aspect of it) after considering abortion or keeping the baby herself. There was real tragedy and suspense in the story as well as a few touching moments. But it was first and foremost a story. We didn’t tell the reader how to feel about it. Same for the Karl Ranck story. A dramatic tragedy presented without hollow “solutions” for the issue involved. We showed the consequences of gun violence and maybe left the reader conflicted or frustrated. But we offered no pat political solutions. I feel we did these stories without stereotype or caricature or going down the weak cheese road so many of these “issues” stories do. Any stories that you weren't able to tell (Batman, Nightwing, Birds [of Prey] or Robin) that you can reveal? Any stories that originally had a different ending but it went in another direction? Nothing I can think of right now except that my plans leading to Robin 100 and beyond were pretty cool and I regret not being able to do that story. My plan was to have Tim quit as Robin and become the new Blue Beetle under Ted Kord’s [i.e., the old Blue Beetle's] guidance. Batman would pick Steph to take on Robin’s role. Tim would then be featured in a six-issue mini as Blue Beetle until events in the Batbooks would bring him back to the fold. The idea coming out of this would be a BB ongoing in which Ted gets the idea to create what amounts to a Blue Beetle franchise. He creates what amounts to Blue Beetle Inc and has a representative in every DCU city. I was shot down on this one over and over. As soon as I left the title they did a kind of pale version of the story I had been proposing for more than a year. Had you stayed on the title [Robin after #174], what were your plans for the book? Well, I written about eight more scripts. There was a storyline with Steph’s dad and the return of some Robin villains in a new way and the introduction of several new bad guys. Much of this is hazy in my mind already. Lots of changes were made as I was writing and the direction of the book was being altered even as I was in the middle of a story arc. Since Chuck Dixon returned to “Robin” – the DC Comics series he helped launch in 1993 and wrote for 100 issues -- in January, the fan favorite writer has been teasing readers of Tim Drake’s solo title with sightings of one of his most popular supporting characters – The Spoiler. The high-flying heroine has also been spotted of late in the pages of Frank Tieri’s “Gotham Underground” miniseries. Trouble is, Spoiler – also known as Stephanie Brown -- died at the hands of the supervillain Black Mask in the controversial 2004 Batman story “War Games,” after Dr. Leslie Thompkins chose not to save her life; a decision Thompkins made to teach Gotham’s youth the lesson that fighting crime was not a wise career choice. With solicitations for May’s “Robin” #174 and June’s “Robin/Spoiler Special” both hyping a big reveal for the character, CBR News contacted Dixon to see if he would play spoiler on Spoiler. “We are planning a limited series and she will be seen in upcoming arcs in the ‘Robin’ monthly,” said Dixon, who created the character in “Detective Comics” in 1992. “Frankly, Spoiler began as a pure plot device and evolved, because of fan interest, into a romantic foil for Robin. I’m not really certain of her intrinsic importance to the Bat-verse other than the fact that she’s become a beloved supporting character.